With approximately 900 Oklahomans waiting for a lifesaving transplant, and more than 123,000 Americans on the list, there is no telling whose life you could save. 1. ON YOUR LICENSE OR STATE ID CARD - When you get your driver’s license or state ID card, you will have an opportunity to say yes to organ, eye and tissue donation and you will have an opportunity to donate a dollar to the Oklahoma Donor Education Fund. If you have registered on your license or state ID card, you do not need to register in any other way. 2. ONLINE – If you have not registered on your driver’s license or state ID card, you can go online anytime and register in just minutes at www.LifeShareRegistry.org. Registering online gives you the ability to access your registry page and change your donation information. 3. 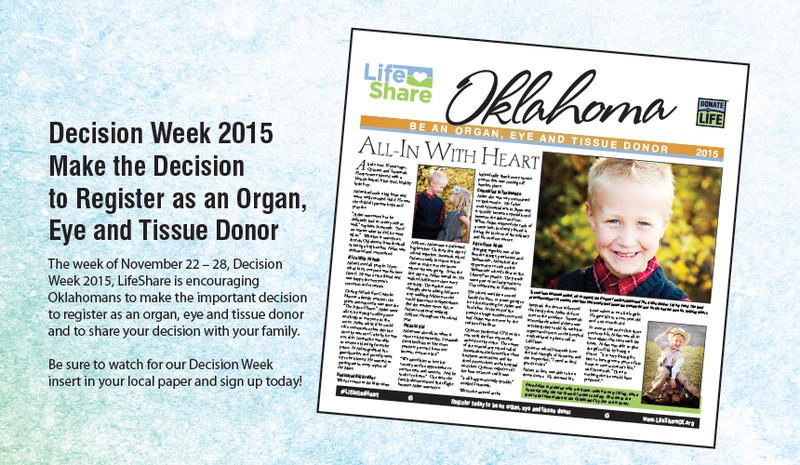 ON THE PHONE –You can call 800-826-LIFE (5433) and request that a donor registration form be sent to you. After you complete the form and return it, your name and donation wishes will be added to the LifeShare Donor Registry.